Memorial at West Norwood Cemetery. Thomas Cubitt (1788-1855), the most successful of the nineteenth-century London builder–developers; although often addressed as 'architect' he insisted on being called a 'builder'. 1788 born at Buxton, near Norwich, eldest son of Jonathan Cubitt (1760–1807), a Norfolk carpenter, and Agnes Scarlett. Other brothers included William and Lewis Cubitt. 1814 became a member of the Carpenters' Company by redemption. With the proceeds of working as a carpenter on a ship to/from India, he set up in business of his own in Holborn. 1810 His brother William Cubitt joined him. 1815 the business was moved to Gray's Inn Road. Cubitt developed a system by which he employed workmen of all the building trades directly. His difficulties dealing with architects made him concentrate on speculative development rather than contracting for buildings. 1819 Married Mary Anne Warner. 1824 First large development was on the Duke of Bedford's estate in Bloomsbury followed by other major developments in London including Pimlico, nicknamed 'Mr Cubitt's District', laid out on a grid plan. As part of the development he built several hundred yards of the Thames Embankment. By 1824 Thomas was in partnership with two of his brothers as "Messrs. T. W. and L. Cubitt", though this was dissolved in 1827. 1827 the partnership between Thomas Cubitt and his brothers William and Lewis was dissolved. William retained the Gray's Inn Road works, which became one of the major Victorian contract building firms, while Thomas and Lewis concentrated on speculative development. 1831 Lewis left Thomas and re-joined William in his business. Cubitt developed an integrated building works at Thames Bank, between Vauxhall and Chelsea, where much of the materials used on his developments were produced. He also had a brickworks on the Medway. 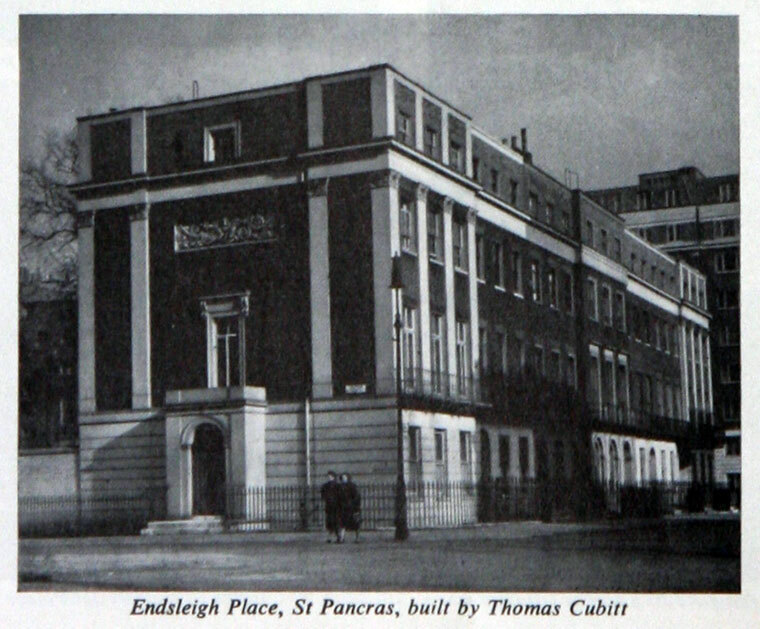 1839 Thomas Cubitt of Eaton Place, Belgrave Square, became a member of the Institution of Civil Engineers. Credited with having first brought the Great Exhibition project to Prince Albert's attention. Also played an important part in negotiations for the South Kensington estate of the Royal Commission for the Exhibition of 1851. 1855 Died at his home, Denbies House, near Dorking. 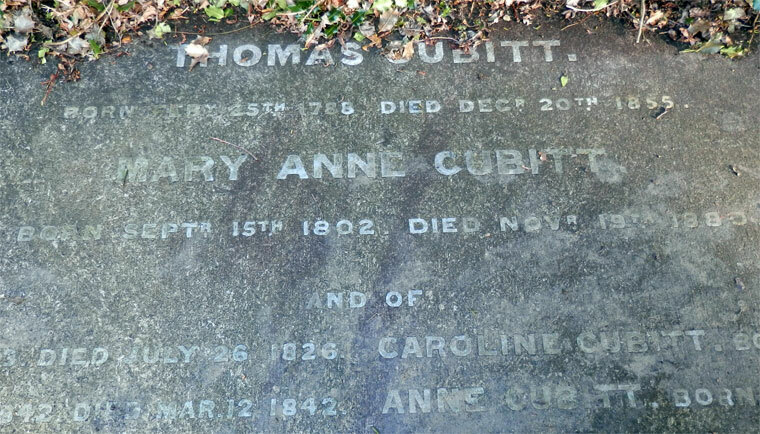 Thomas Cubitt was born at Buxton, near Norwich, on the 25th February, 1788. In early life he worked as a journeyman carpenter, and with a view to improve his circumstances, he made one voyage to India, as a ship-carpenter. With the savings he then made, he, on his return to London, commenced business as a master-carpenter, being at the time about twenty-one years of age. His first work of any extent, was putting the new roof on the Russell Institution, in Great Coram-street, under the superintendence of Mr. John Shaw, then architect to Christ’s Hospital, London. This was completed to the entire satisfaction of the committee and of the architect, so that when tenders were advertised for, for the building of the London Institution, in Finsbury Circus, Mr. Cubitt’s offer was accepted, mainly on the recommendation of those who knew how well his work had been done at the Russell Institution. The foundations were laid in May, 1815; and, shortly afterwards, as appearances of success began to manifest themselves, he took a tract of land from Lord Caltharpe, on the east side of Gray’s Inn road. Here he commenced the erection of large workshops, purchased horses, carts, and materials, and engaged gangs of carpenters, smiths, plumbers, glaziers, painters, bricklayers, etc with a foreman for each class. Before that time, the building trade had not become, as now, a regular business, but was divided among different branches, which, in a manner, worked independently of each other. Finding the inconvenience of this, he employed workmen of all these classes, and consolidated them into one establishment. As this increased, he found, at times, a difficulty in obtaining a constant succession of work, so as to keep his men regularly employed, without the necessity of discharging them, just as they had become used to his system. This first led him to take ground to build upon, a species of speculation which afterwards became the employment of his life; for as these engagements became greater, they gradually absorbed his capital and attention, until he finally relinquished the general business at Gray’s Inn Road to his Brother, William (the present Alderman Cubitt, M.P. Assoc.Inst.C.E. ), and, with very few exceptions, entirely devoted himself to building, from his own designs and on his own ground. His plan was to take a large tract of unoccupied land, sometimes from several distinct land-owners, and to lay it out on one great plan of squares, streets, roads, &C., as a whole, sparing no expense in the outset, in drainage, forming gardens, planting, laying out wide streets, and using every endeavour to keep up the character of the whole. His first undertaking of this kind was at Highbury, occupying a commanding site in the parish of Islington. Here he erected some moderately-sized villas, with good gardens, which were soon eligibly let and sold. He next raised detached villas and row of houses on a piece of land between Newington-green and the principal street of the parish, and, in this instance, he had to make roads of approach to the proposed new buildings. He then purchased, and made freehold, a nursery-garden and grazing-ground, six acres in extent, called Barnsbury-park, abutting on the Liverpool, or Northroad. This land he laid out for streets and squares, and built a few houses and villas as examples, letting off the remainder to other builders, who erected houses on a smaller scale. About the year 1824, a large tract of land in the parish of St. Pancras, within a short distance of the establishment in Gray’s Inn Road, attracted his attention. Having taken a lease for ninety-nine years from the Duke of Bedford and Lord Southampton, the ground landlords, he successively built the houses of Upper Woburn place, Woburn-buildings, Gordon-square, Tavistock, Gordon, and Endsleigh-streets, as also nearly the whole of Gordon-square, with part of the south side of Euston-square. Perceiving the tendency of the fashionable world to move westwards, Mr. Cubitt, in the latter end of 1824, or early in 1825, fixed upon a tract of land, upwards of 140 acres in extent, belonging to the late Marquis of Westminster and Mr. Lowndes, near to Buckingham Palace, and known as the Five Fields, Chelsea, with the ground adjacent. On this locality, Belgrave-square, Lowndes-square, Chesham-place, and other ranges of houses, were erected. Mr. Cubitt subsequently further engaged to cover the vast open district lying between Eaton-square and the Thames, now known as South Belgravia. 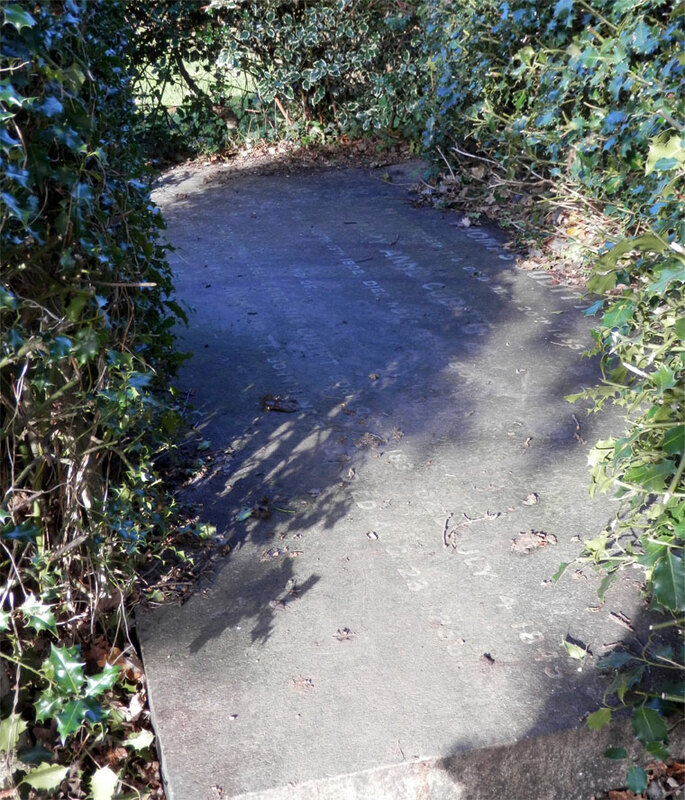 He also carried out similar operations at Clapham Park, a large open tract of land, 250 acres in extent, about four miles south-west of London. This he leased of Mr. Atkins Bowyer, the lord of the manor, and distributed it in lots for detached mansions and villas on a large scale. He formed wide roads, four miles in extent, purchasing adjacent property to enable this to be systematically accomplished. He commenced building large mansions, and invited the public to take sites for others; and from that time to the present these works have been continued, until the whole ground is now nearly covered. At a later period Mr. Cubitt had the honour of being sent for by Her Majesty, to advise upon the alterations of the house at Osborne, in the Isle of Wight, and he eventually designed and constructed the new marine residence there, to the entire satisfaction of Her Majesty. He was also employed to build the east front of Buckingham Palace, and other works of magnitude connected with the Crown. Mr. Cubitt felt a deep interest in the question of the sewage of the Metropolis, and in 1843, he wrote a pamphlet for private circulation, advocating the views on the subject now become general. These were afterwards embodied in a letter to the 'Times,' when the subject began to attract genera1 interest. He took great pains to stop the smoke nuisance from large steam chimneys, and completely effected this object at his extensive factory at Thames Bank, which he had erected after leaving the establishment in Gray’s Inn Road. He was a great advocate for leaving open spaces, for recreation, in the midst of London; and took a principal part in the plan of Battersea-park, of which he was one of the originators. When the scheme was attacked by Mr. Disraeli, then Chancellor of the Exchequer, he offered to buy the whole of the land and the bridge, from the Government, at the sum they had expended upon it. Anticipating a great increase in the size of London, he urged several times, on the Government of the day, the policy of buying tracts of unoccupied land along the river banks above London, in order that they might be devoted to public parks, before the value had become great, from the increase of building. In the embankment of the Thames above Vauxhall-bridge, he was the principal mover, and constructed about 3,000 feet at his own expense, adjacent to South Belgravia. From his long experience of building, and great practical knowledge of all its details, his advice was constantly sought by various branches of the Government, on questions of this nature. He was frequently examined by Committees of the House of Commons on the same subject, and took a leading part in the preparation of the late Building Act. He gratuitously undertook the negotiation for the purchase of the property at Brompton, on behalf of the Commissioners of the Great Exhibition of 1851, for which he was well qualified, from his great experience in such transactions, and to this he devoted a great deal of time in the latter years of his life. He was also one of those who guaranteed a sum of money to carry on the Exhibition of 1851, when its success was doubtful. Shortly after the commencement of his great undertaking, a monetary panic occurred, which caused almost general ruin, but his undaunted courage and perseverance carried him through the difficulties which arose from it. To accomplish his multifarious works, sometimes with urgency and rapidity - at others, with caution and apparent timidity - required unabated vigilance and circumspection. At times, more than two thousand men were employed, all of whom had to be regularly paid, in addition to superintendents, clerks,and foremen, besides providing materials, and for the wear and tear of machinery. Through life he was the real friend of the working man; and among his own people he did much to promote their social, intellectual, and moral progress. He established a workman’s library; a school-room for workmen’s children; and, by an arrangement to have supplied to his work-people wholesome refreshments at low rates, did much to establish habits of temperance amongst them, in place of those of drinking which formerly existed. To those under him, and holding responsible situations, he was generous and kind, blending his position as master with that of a friend. He was a liberal benefactor to churches, schools, and charities, in those places with which he was connected, and always valued, in a peculiar degree, the advantages resulting to the poor from the London hospitals. 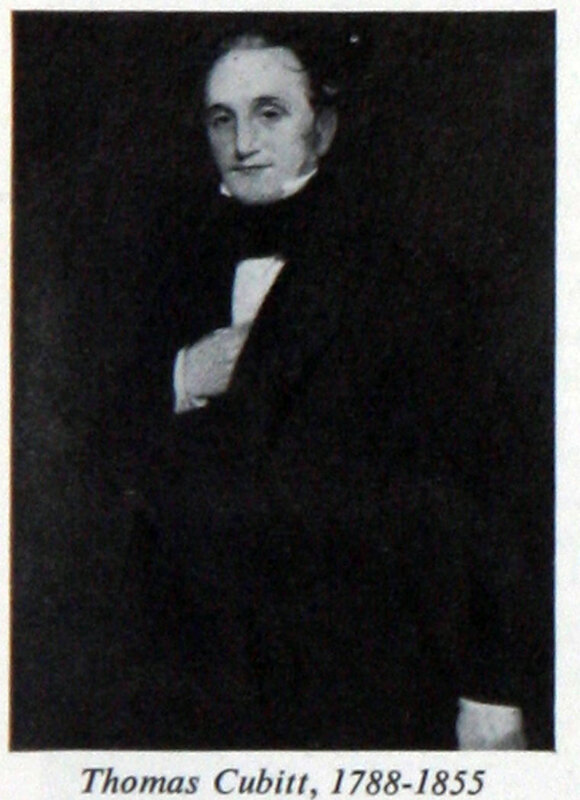 Mr. Cubitt joined the Institution as an Associate in the year 1839. He contributed two Papers to the Proceedings, one 'Experiments on the Strength of Iron Girders,' giving the results of experiments on sixty pairs of cast-iron girders, varying from 7 feet 6 inches to 27 feet in length; the other 'Experiments on the Strength of Brick and Tile Arches,' being the result of an investigation as to how the greatest amount of strength could be attained in fire-proof floors, with a due regard to the space occupied, and the cost of the structure. He was much attached to the Institution, and constantly had recourse to it for information. His career was very eventful, and he was decidedly the pioneer of the great building establishments of the metropolis, and in the principal provincial cities and towns. Like the engineering contractors, the great builders have grown out of the peculiar wants of the period, and few men have gone through great labours and executed gigantic works with such equanimity as Mr. Thomas Cubitt. He deservedly accumulated very considerable riches, and acquired reputation, and at his decease, which occurred in his 61th year, at 1hs seat, Denbies, near Dorking, on the 20th December 1855, he was surrounded by the members of his family, by whom, and by a large circle of friends, he was deservedly beloved and regretted. This page was last edited on 20 March 2017, at 21:51.